Mutant Fish or Media Hype? | FISHING FURY - A Fishing Blog with Attitude! Mutant Fish or Media Hype? I’d like to start by saying I’m sure there are mutant fish out there, but this is not on of them. Have a look for yourself. 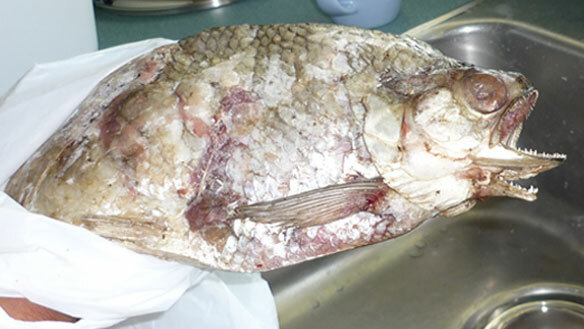 This fish has been big news in Alberta, Canada since it was caught by some children in Lake Athabasca on August 15th. 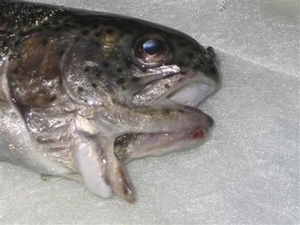 There has been a growing concern about environmental damage in the area and this “two mouthed” fish is believed to by a product of pollution. Now, I hate pollution as much as the next guy, but animals mutate with or without pollution. More importantly this is not a mutant fish, its a fish that was most likely on a stringer and had its lower jaw torn. The real news on this fish, that no body seems to be acknowledging, is that it may not be a fish native to Canada. I’ve fished all over Canada and never seen anything like it. I honestly have no idea what type of fish it is, but I would love to know – anyone out there recognize the above fish? UPDATE – It’s a goldeye and they are common in Alberta. Thanks Dwayne! You may be wondering how I’m so sure that the fish really has only one mouth, well its not the first time we’ve seen news about a two mouth fish. 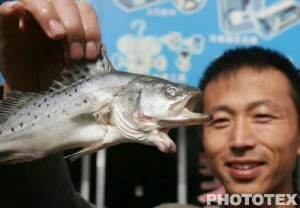 Here are two examples of fish that were said to have two mouths only to be disproved. Anyway, I’d love to see what a real scientist has to say about this. UPDATE 2 – According to the Canadian Encyclopedia, goldeyes have many small sharp teeth on their jaws and tongues. It is pretty badly beat up, but this is definitely a goldeye which is native to the Athabasca system. Thanks Dwayne, I guess the next question is, do goldeye have more then one row of teeth?